Lot’s going on — busy, busy, busy!!! All kinds of stuff to blog about and purge from rattling around in my mind!!! So, I will take a few minutes out of my beautiful, relaxed Saturday morning to capture some of my thoughts before I decide what all is in store for me today! Peruse through to hear about my recent adventures and see how pretty some of the key features in my yard look! As for the trip home…….we crammed in a lot of stuff and managed to do a lot of relaxing, too! Mom and I went out to dinner Friday night after she picked me up at the airport. Then, Saturday was a full day — it started out with Mom and me making a big macaroni salad together – by the time we both stopped adding stuff that we each put in “our” mac salads, it ended up being quite a mixture of both of our styles and it was SOOOOO good!!! hahaha Then, we went to get flowers for the cemetery from Navarra’s and took them out to fill the crocks and wash the head stones of those who have gone on before us. All are nice and bright and cheery for the summer season! Then, we enjoyed an ice cream sundae at Double Dips before we went home to meet my brother and his wife for a cook out! Zweigles hot dogs on the grill, macaroni salad, devilled eggs, etc…… Mom and I ended the evening watching a couple of movies! Sunday was another day for the family to get together – my brother, sister-in-law, and nephew went out for lunch and then went back to Mom’s. More food and movies and fun! Monday was a relaxing day with just Mom and me before I headed to the airport, only to come back for a “bonus” night with her! 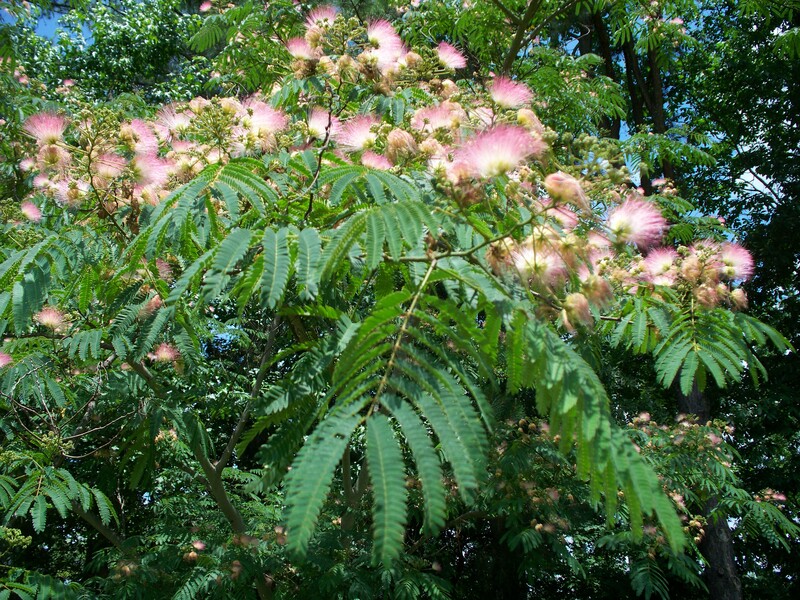 This morning, I snapped these two pictures of my beautiful, crooked mimosa tree! 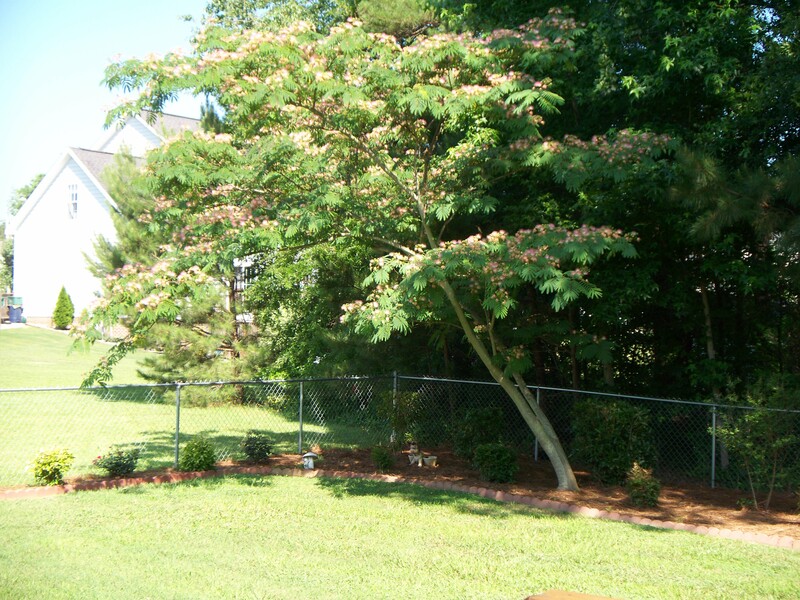 I love this tree and look forward to it blooming every year about this time! 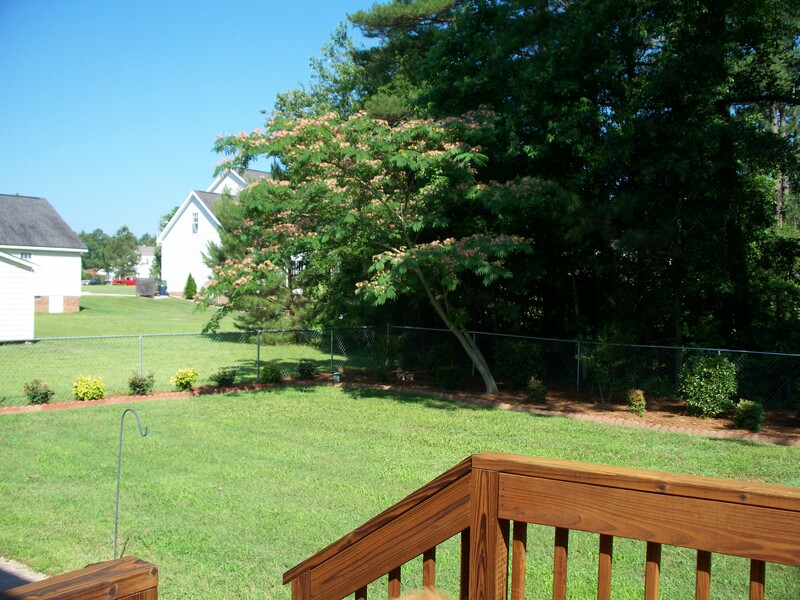 When I first moved into my house, most of the back yard was crammed full of wild weeds and stumps and broken trees and vines. It was unusable, so I rented a back hoe and Ronald, Robby, and I worked to clear it out so I could do some nice landscaping and use the entire yard……OK, so it was actually mostly Ronald and Robby, but I also put some time in on the back hoe tearing out tree stumps and debris! 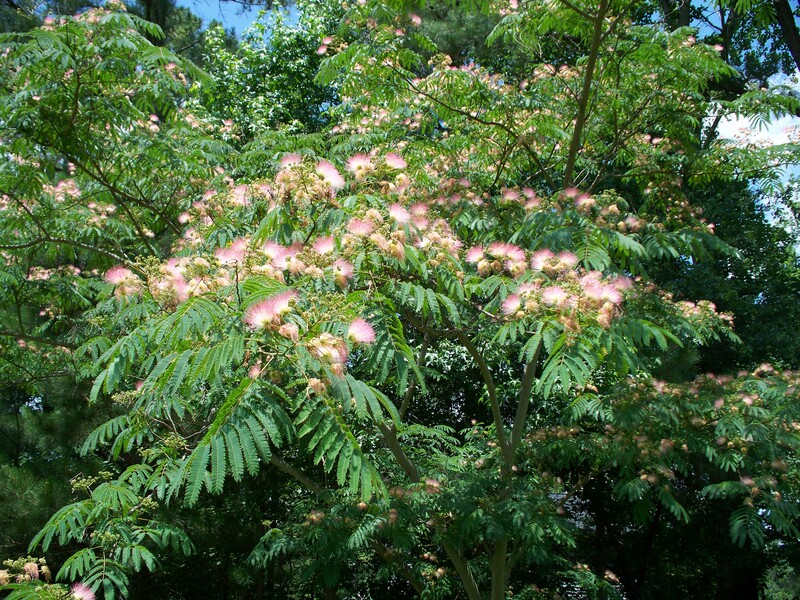 One tree they wanted to pull out was this mimosa tree — because it had grown crooked and looked weird! But, I wouldn’t let them — I thought it was quirky, not weird, and if it fought that hard to make its way up through all the crappy stuff to survive, then it deserved to continue surviving! And I think it makes a perfect statement in my landscaping! Yeah, I know – these grow wild all over town and are messy when they shed their blossoms, but I still love it and it isn’t located where the messy blossoms are a problem! 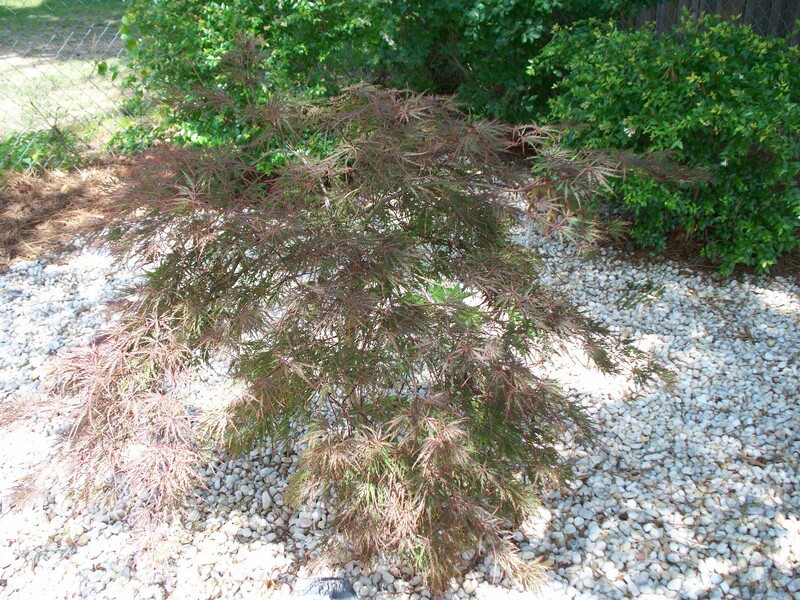 But, I do cut down the new ones that try to come up from the seed pods it drops – I don’t want a forest of them! hahaha Look at how pretty it looks in the corner of my lot and check out that gorgeous Saturday morning blue sky! 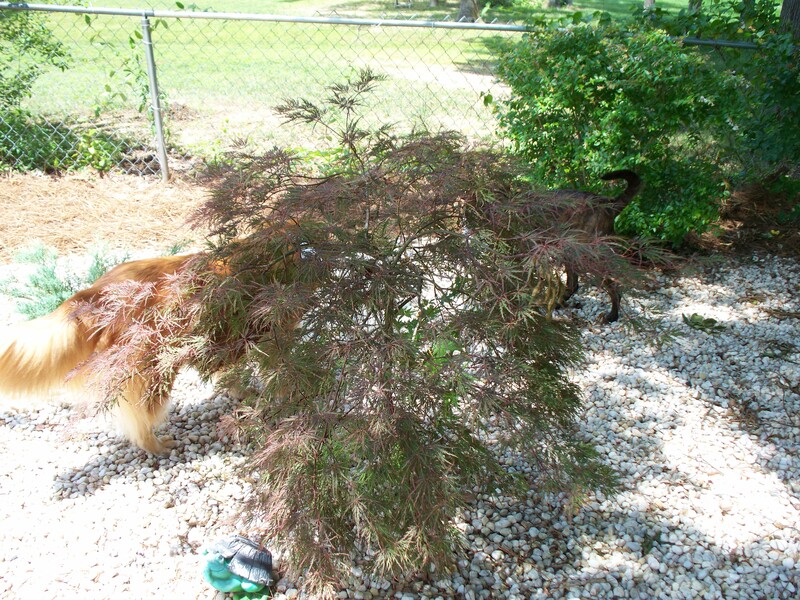 My special little Weeping Japanese Red Maple is really taking off and branching out. It was just a twig when the elves planted it a few years ago and in the last year or so, it has started to really get full and pretty! I adore it and it makes a perfect feature in the opposite corner of the lot that the mimosa is on. 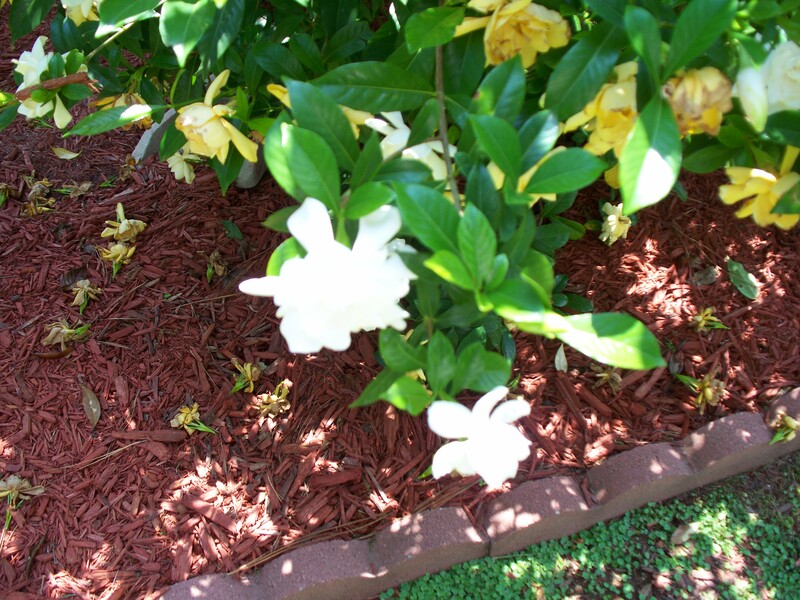 I almost missed the Gardenia blossoms across the back of my house!!! The buds were just barely ready to pop when I left and by the time I returned, some of the blossoms were already spent! But, it is still blossoming and I am so enjoying them – they smell so marvelous and look so beautiful! 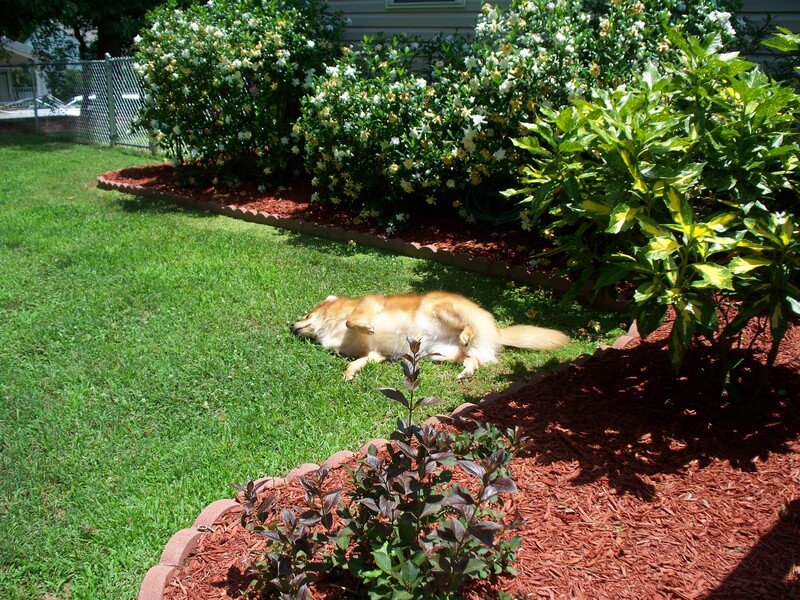 And Katie is loving the warm grass in front of the fragrant gardenias this morning, too! So, that’s all for now…….I want to get out and enjoy this fabulous day! I have to tell you, I would’ve gone with the guys when it comes to that mimosa. You know it’s a highly invasive weed, right? We have been battling them both in our yard and my mom’s. They are indestructible! 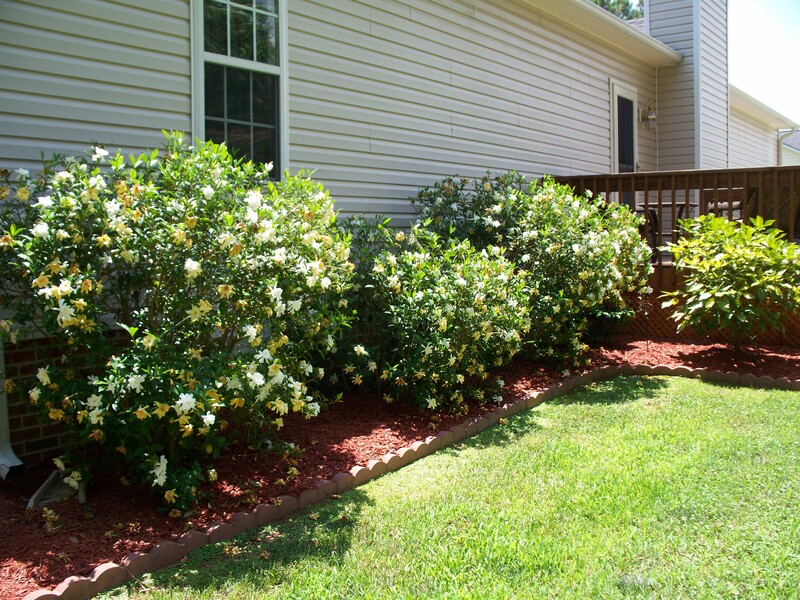 However, we have several gardenias that looks so gorgeous next to our blue hydrangea. Love those!